After giving it a good polish, Richard climbed in the LS7 and put it through its paces. How's this strap go then? Welcome to Mike Sheppard who continued his PPL conversion course in today. 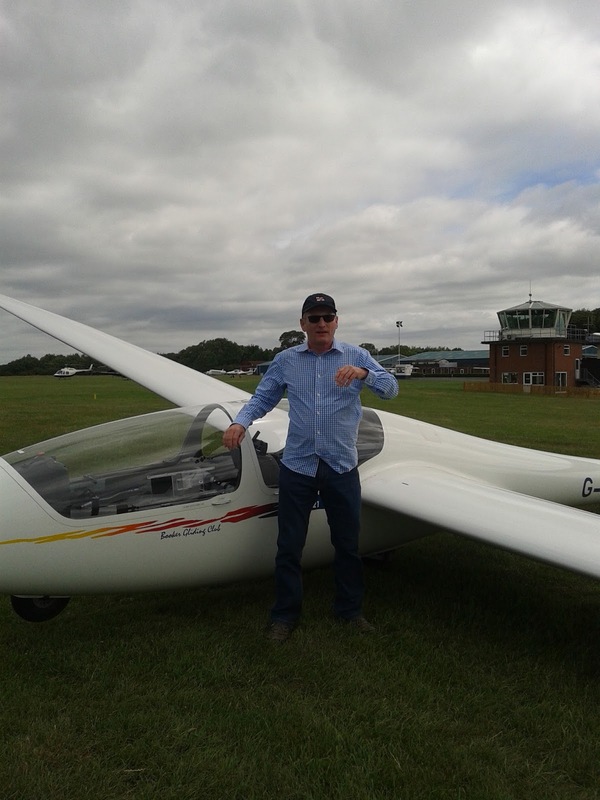 John Blake resoloed today, very well done to him. He went solo and achieved a bronze C many years ago. Let's hope we see more of him and also see a few more solos over the coming months. Wall to wall cloud today, only good enough for groundschool. 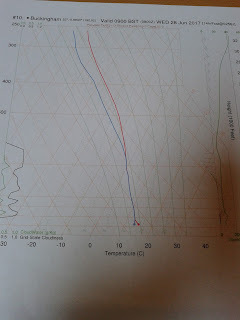 As you can see on the sounding, pretty cloudy today! 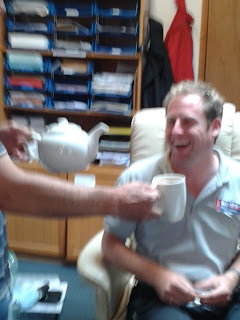 Of course this didn't stop Bob from testing out the new teapot. 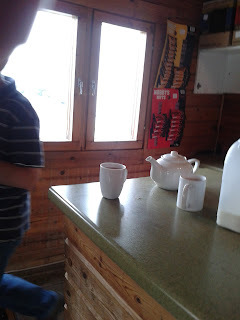 The theory is we will save on teabags, any views? 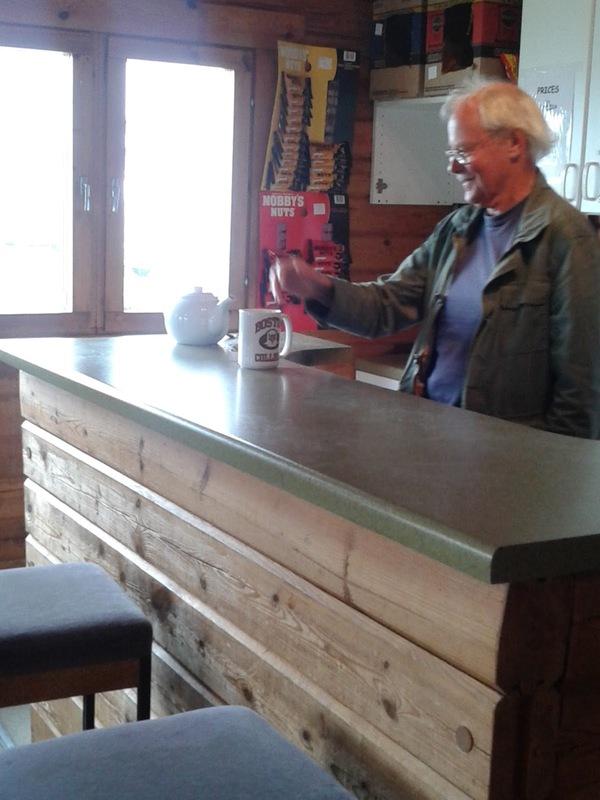 Richard enjoyed a cup as part of the tasting session. Graham Saw can be seen trying to escape a photo opportunity. I asked him for an endorsement of the new pot, he declined saying that someone in his position shouldn't be seen to endorse a commercial product. He didn't really I just made that up. Light winds , blue thermals with the occasional haze caps. 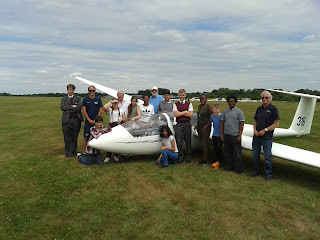 A good turnout of club pilots taking advantage of the conditions. Blue is not popular, so good to see so many giving it a go. Plenty of sunscreen, hats and water needed today. Hammersmith Academy arrived around 10am and spent the day with us. The pupils have all been first class at the Academy and being rewarded with a flight in a glider. We were all impressed by their obvious interest in aviation and the discipline showm on the airfield. Thank you Hammersmith Academy, we hope you all enjoyed yourselves and we look forward to meeting again. Many thanks to the helpers, tug pilots Jim and Rocky, and instructors Chris and Bob and groundcrew handled single handed by Maddi, without your support the day would not have been a success. After a fortnight of glorious weather the 2017 summer expedition is drawing to an end. 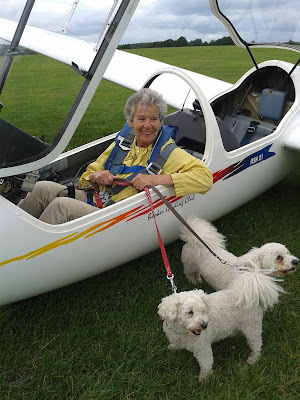 A short day's flying, gliders were derigged and put in trailers ready for the journey home. 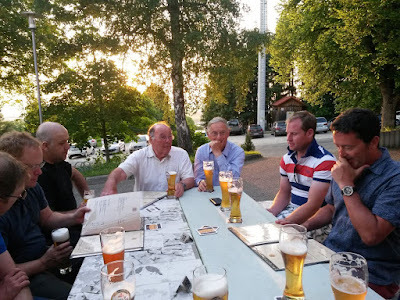 As previously said, our thanks to our generous hosts at Klippeneck and to Richard for his hard work both during and in the run up to the expedition. Martin Wheatley enjoyed a trial flight. 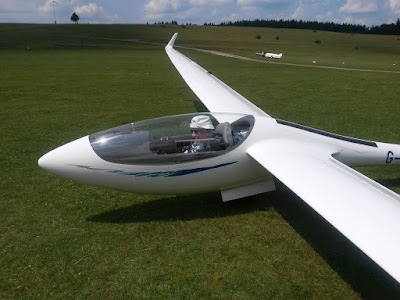 "I think, with practice, I could fly one of these" - yes I think so too. Meanwhile his wife with spaniel watched on from the launchpoint. 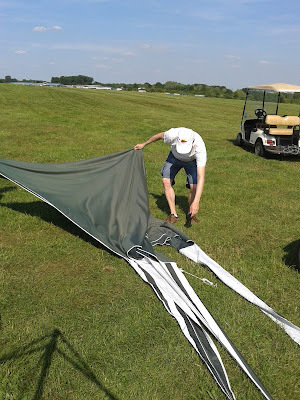 Luke Bishop arrived to find it a little too windy for early solo flight but had a great dual training flight and finished off with a very good landing in difficult conditions. 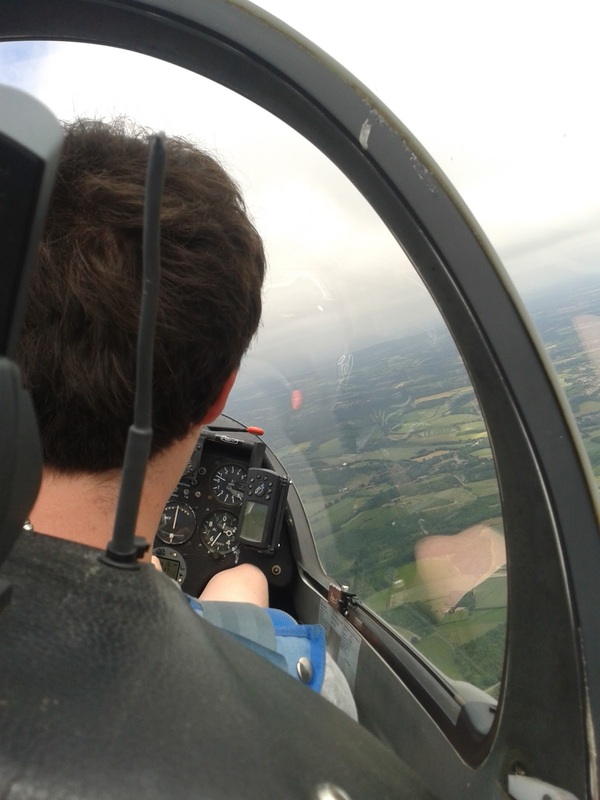 Luke took full advantage of his time with an instructor and agreed a training plan. Bronze by September? Any one interested in joining him? 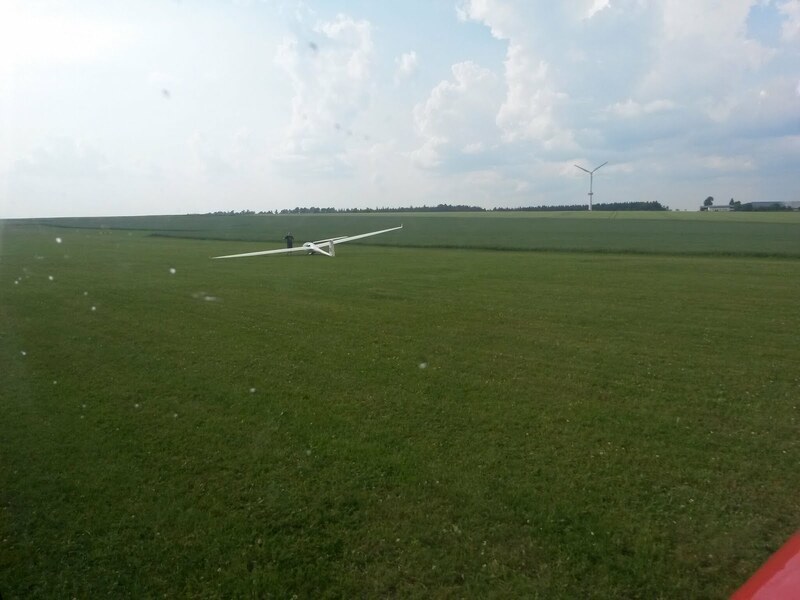 22 June 2017 - 6 training flights in 1 hour - beat that! 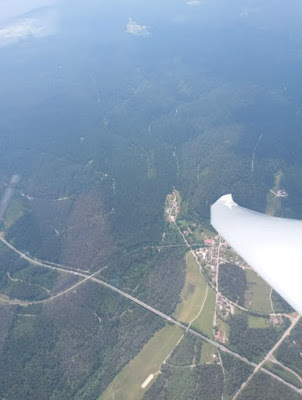 Winds 270/11, cloudbase 1200ft to start. Cold front to the NW passing through during the afternoon. Plenty of helicopter activity as HeliAir transported to and from Ascot. 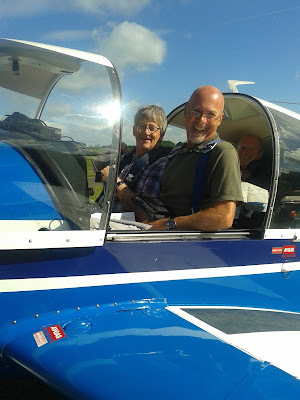 Jim in the tug did a grand job co-ordinating helicopter departures and arrivals to the South and making sure gliding operations didn't conflict - well done Jim. Bob, Jack and others planned a trip to Goodwood, and set off after lunch. Meanwhile Jo Shepherd had groundschool (Airbrakes and Approach control) and then went out to practise. Well, he got the landings so precise the tug could simply swing in front and off we went again. 6 circuits in 60 minutes - pretty impressive. 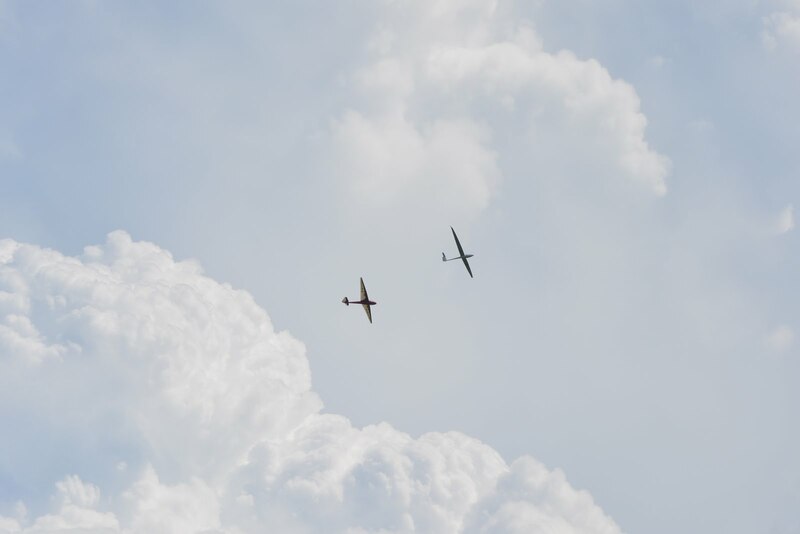 Congratulations to Hakan and David L for doing their Silver distance and heights. Paul F practised for a 300k but the thunder storms on track meant it wasn't to be. Hakan's day got better with a landout 20k to the south east just before the heavens opened with hail and rain. 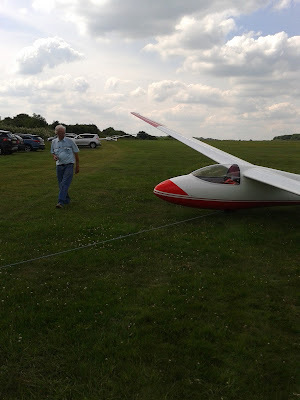 An aerotow was sorted once the storm had passed through (just as well as his trailer is away at Spindleberger being refurbished). 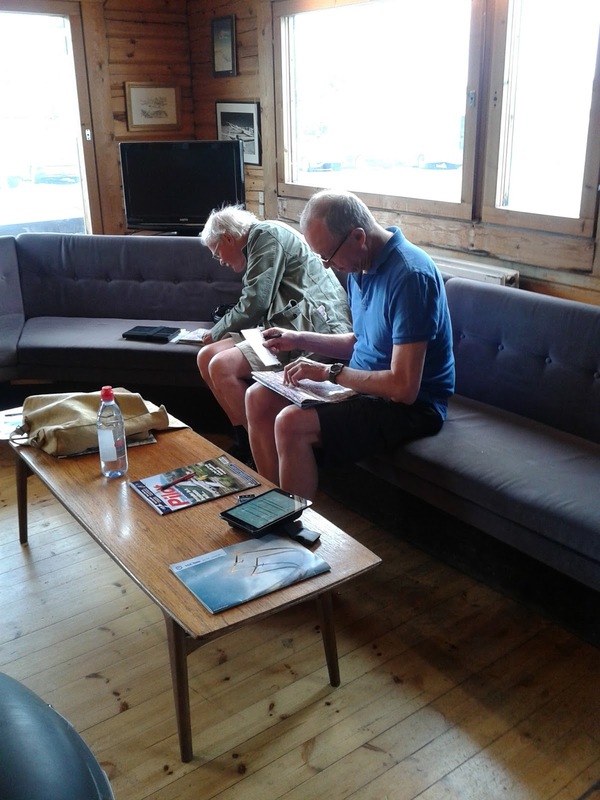 John enjoyed a couple of hours in Graham's Petrel. 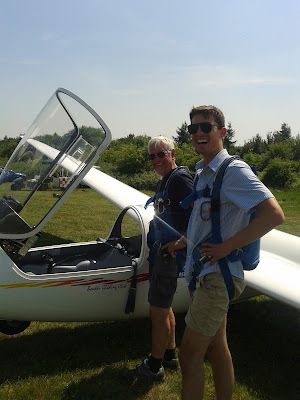 We can neither confirm nor deny whether Graham flew Tupperware again. 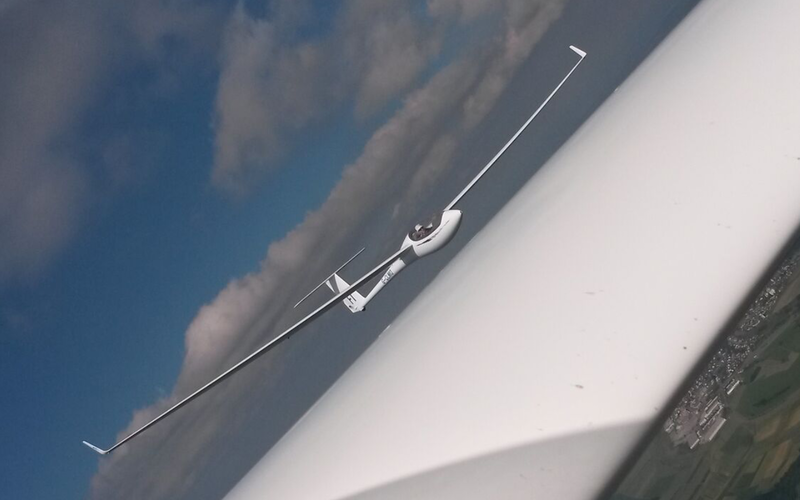 SE winds @ 10 knots, temperatures expected to be 30 degrees, mainly blue with an inversion around 3000QNH. 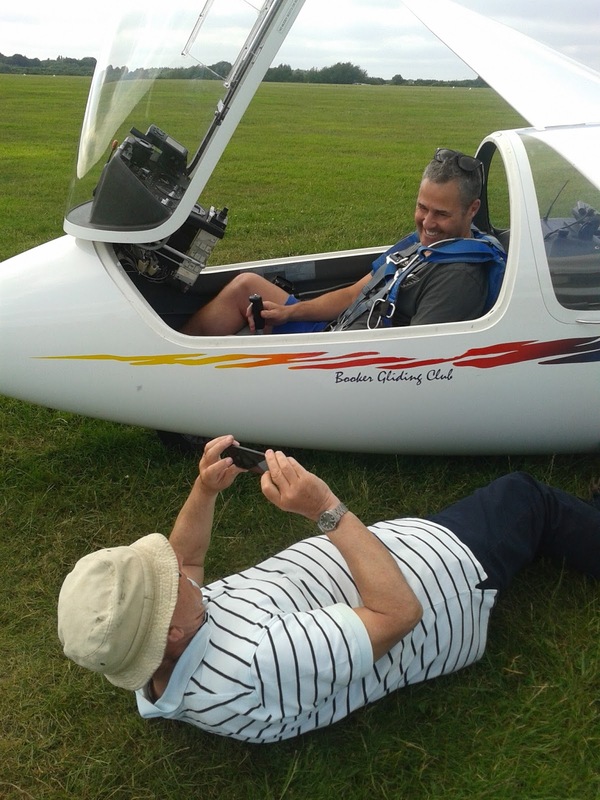 Launching started fairly early with Mike Barnard doing a check flight before his first solo, well done Mike. Mike getting ready to go on his first solo flight. Lincoln Hirst had a very busy (and hot ) day getting to grips with circuit planning. 6 flights later we got it cracked, well done Lincoln. The 2 Richards, I call them Richard I and Richard II, tried their luck with the Junior and did incredibly well in blue conditions. Rocky and Bob did the tugging for us today, thanks chaps, hot work but good fun. The evening group took over and kept flying until 19.50 and landed in the relative cool of the evening. A cooler day expected tomorrow. We shouldn't complain about the heat, before we know it we will be back in winter. 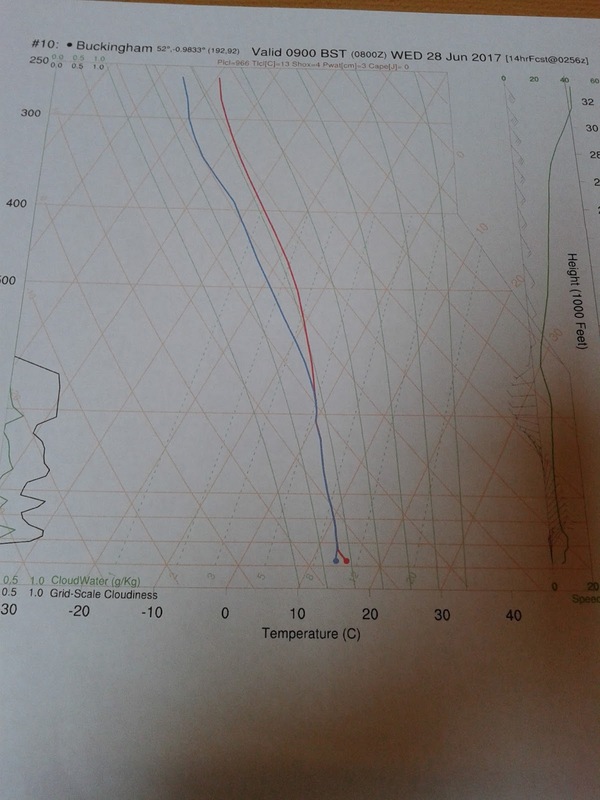 Winds 110/05, the threatened CuNims didn't appear and soaring in the blue from about midday. John Klunder from Camphill enjoyed a local familiarisation flight with Andrew Monk before flying his newly acquired ASW 28 (C6). A quick Bicester out and return to make sure the systems were all operational. John was until recently the CFI at Camphill. Captain Monk also taking the opportunity to show off his summer attire. 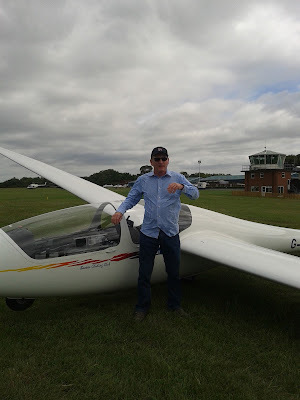 Peter Cross achieved his 2 hour soaring flight for the cross country endorsement - well done Peter. 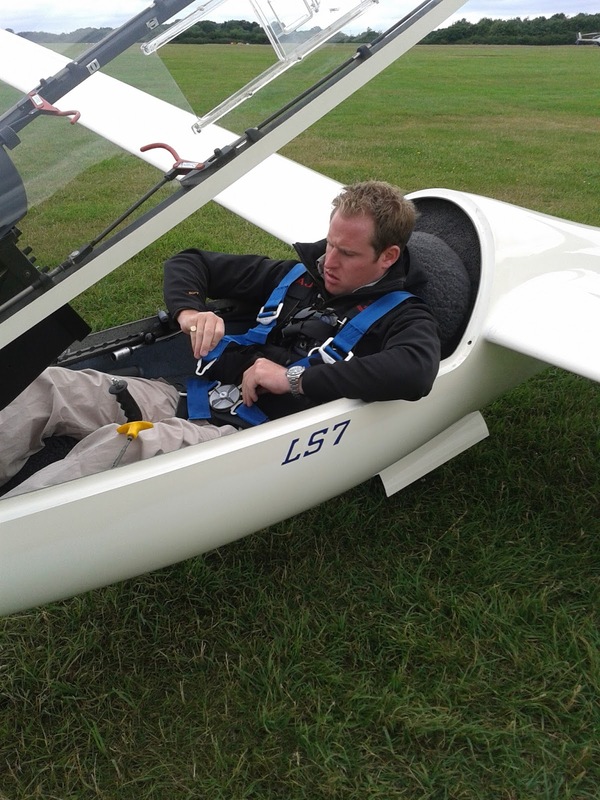 Alistair Gill flew for the first time since 2008, he soon got into the groove and demonstrated a near perfect landing. 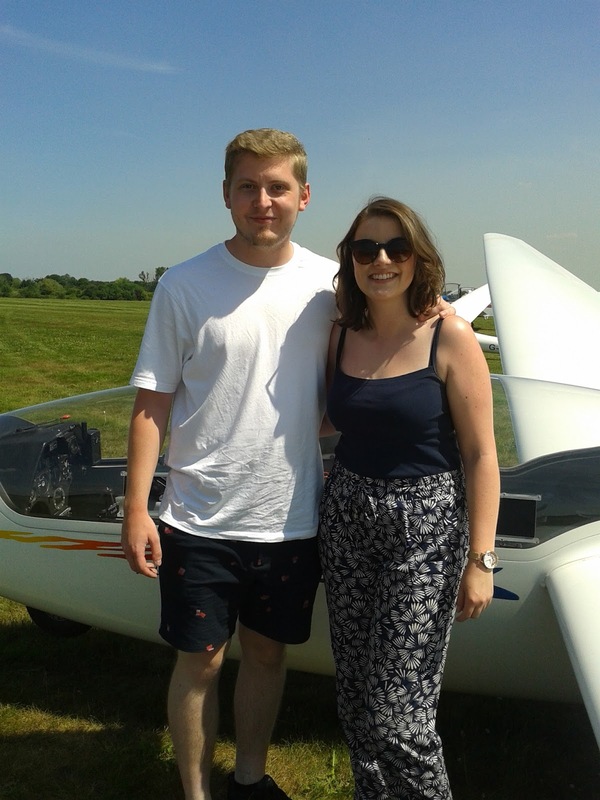 Alistair was a solo pilot at Parham before moving to London and working as a aircraft engineer at Heathrow. Tim Scott vanished in his 29 returning with a flourish at around 5 pm. Lima Hotel returned from Klippeneck having had a wonderful flight across Germany and France in near ideal conditions - big grins all around. The evening group consisted of Brian and his son who both enjoyed a flight on a lovely summer evening. 19 June - Is Amy the new Amy Johnson? Well done Jane for thinking of the Gazebo, good plan good plan. Also a welcome challenge! OK I think I got it now, this is the top? A steady stream of flights, several private single seaters as well as the Junior and K21 flying today, most people returning to cool down. 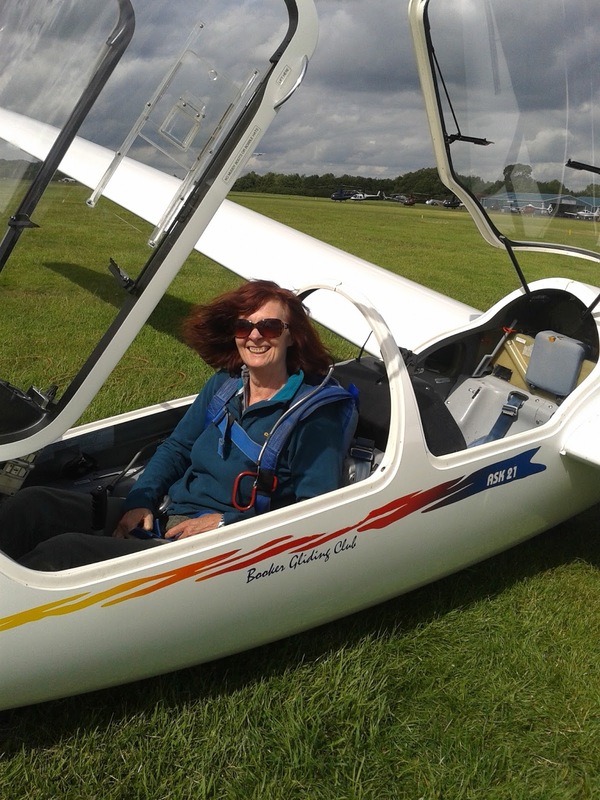 Amy Hopson was treated to a trip in a glider as part of her birthday outing. Jack her boyfriend watched on as she soared away . Amy soon got the hang of the controls and took us for a local sightseeing tour. First time ever on the controls, so very well done. Many thanks to Rocky and Jack for putting up with the heat in the Robin tug, very much appreciated. A couple of hot days at Klippeneck which were mostly blue but as the days progressed some cumulus or haze caps to help show the way. The LH team have been touring around with trip to Samedan (St Moritz) Switzerland, then a trip to Friedrichshafen and tours of both the Zeppelin and Dornier museums (plus finding time for lunch as well) - makes a change from Bembridge! Plenty of flying but let the pictures do the talking (but any rumours of Graham flying "Tupperware" will be fiercely denied). Back at Booker we have been basking in summer sunshine and the weekend was busy with training and trial lessons. Sunday was the better day in terms of xc, it started late but after 1400 conditions really got going and a number of people set off over the hills and far away. 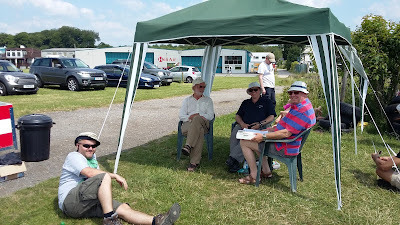 Meanwhile back at base there was competition to squeeze into the shade offered by the gazebo. 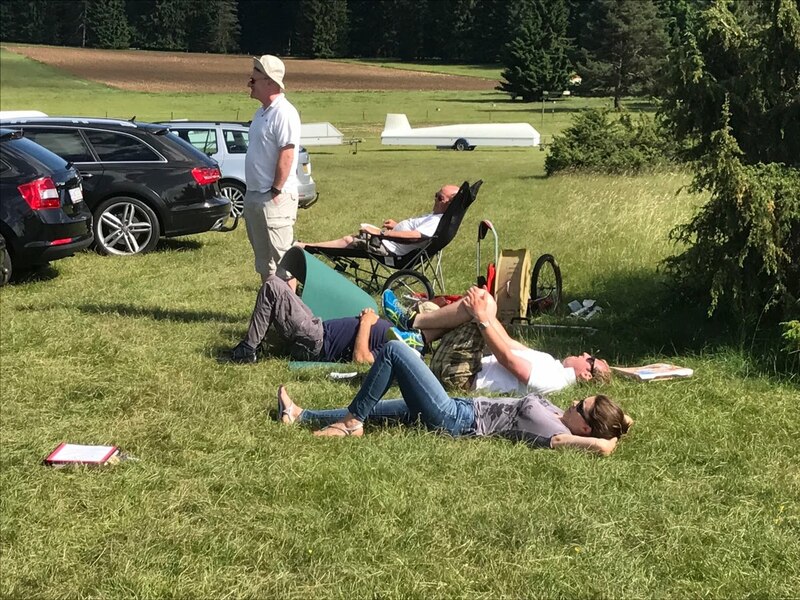 After a leisurely cruise across Northern France the LH contingent arrived at Klippeneck to discover the Booker team members literally rushed off their feet as the evidence shows, only Nick stalwartly resisting the call of the horizontal. The Saturday morning met had promised a quiet day, but the weather Gods thought otherwise and there was plenty of good soaring to be had and the local gliders were out in force to ensure that us visitors from across the Channel didn't have sole use of the sky. The good weather looks likely to continue for the new arrivals from Booker who have trickled in during the day. 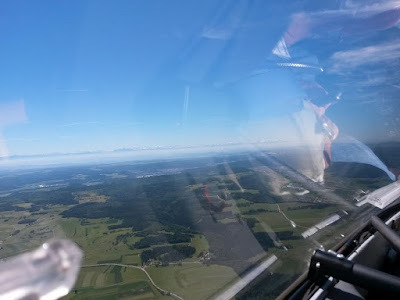 LH is off tomorrow to Friedricjshafen for a much needed drink of Avgas and a tour of the Alps while the new arrivals settle in. 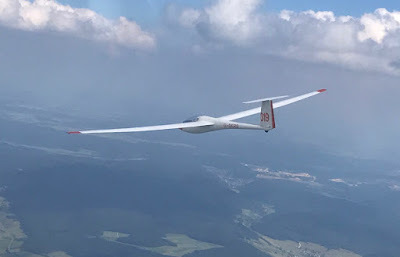 Thursday brought a day of big cumulus and some wonderful flying and fortunately the big storms didn't hit until the evening. 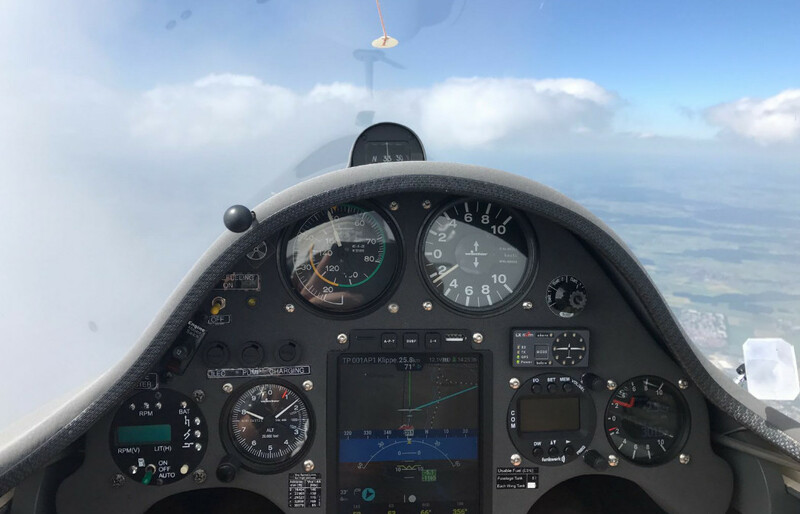 Winds 270/10 and SCT cloud at 3000ft. A warm front passing to the North limited the cross country possibilities, but some good flying was to be had locally. 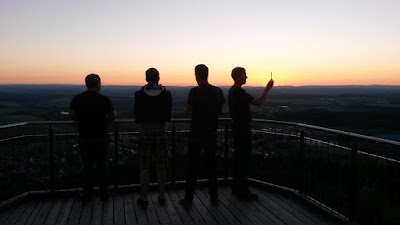 LH set off for Klippeneck, planning a leisurely trip with a lunch stop on the way. Whatever next? Well someone needs to find out what the gang are up to on the expedition. 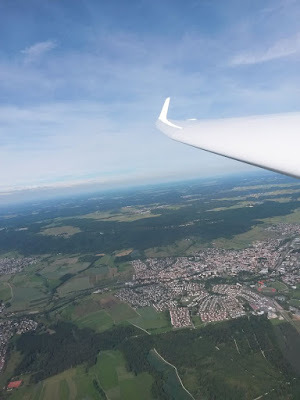 Flight planning done, lets go! 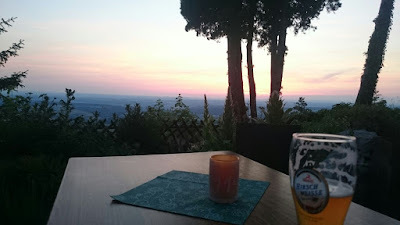 Meanwhile back at home we had a great day. Sohail Mustafa and Ayesha Fiffiqa joined us on a intro course, and Ashlea continued her training, introduced to stalls of varying types. 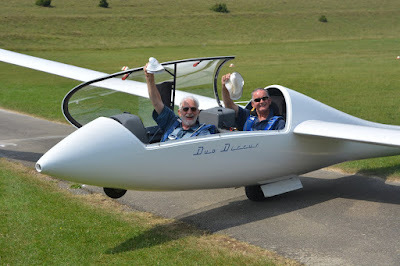 Bob Davey continued the tow pilot training for Chris. 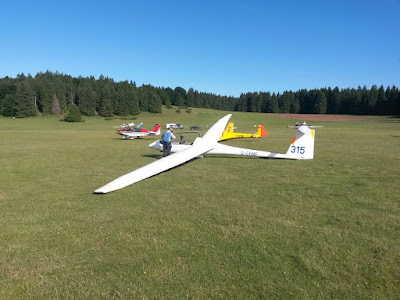 In the afternoon Symeon helped out with the trial lessons, before looking after the evening flying group. 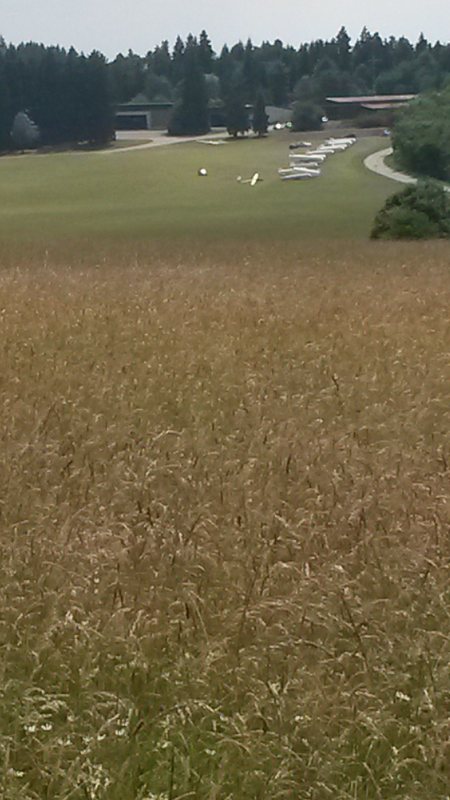 Symeon....is that you lying down on the job ? 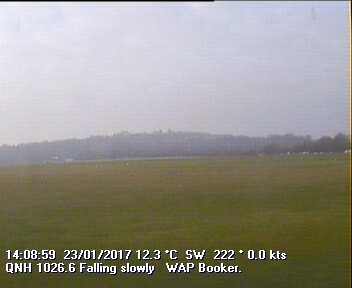 A fairly breezy day today with surface winds 16G26 at times. 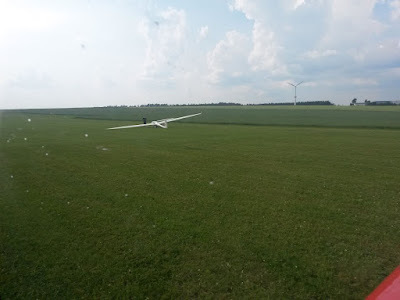 Winds at height were around 20 knots. 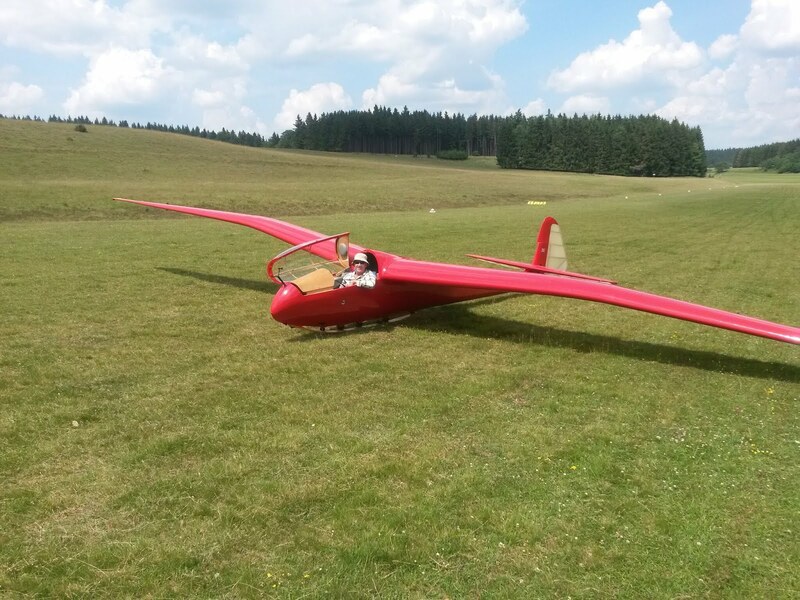 After the cold front passed through there were some very strong thermals but not great for cross country. 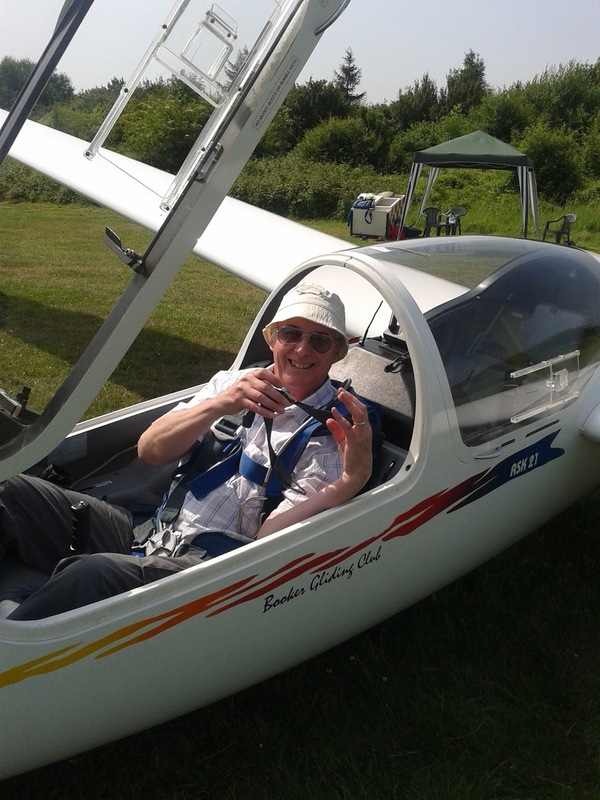 Peter Cross started his Bronze C training and workup today. Everything from spinning, stalls, spiral dives to altimetry and navigation - gosh what a busy day. 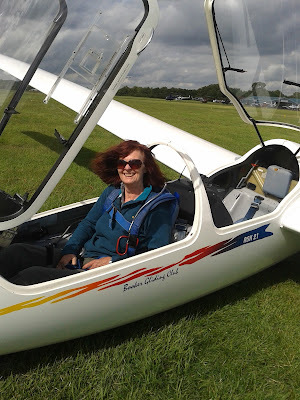 Karen Blair has already been wing walking so a flight in a glider was a very simple affair by comparison, but it was great to see her big smile after a climb in a thermal and flying around under the supervision of an instructor. Here at Wycombe Air Park we think the Klippeneck expedition is having an unreasonable amount of fun, so we will be sending a group in Lima Hotel to check it out and report back. LH leaves tomorrow morning! Winds 140/06 CAVOK, with good thermals from around 10 am. A good number of pilots came out to enjoy the conditions with a number of good flights flown, the best being around 350K. Jim described the early part of his flight as "for the brave" but conditions just got better from there. Andrew Monk stepped in to help with the trial lessons, while Nick and I pressed on with some BI training. Bob just setting off at about 3 pm for 200k via Edgehill and Bozeat..
Richard got his K6 out for an airing. Vic in 315 set the ball rolling and after he hadn't come back for an hour everyone else finally believed it was soarable. Conditions improved as the afternoon went on and good soaring up to 7,000 ft was enjoyed by several pilots. 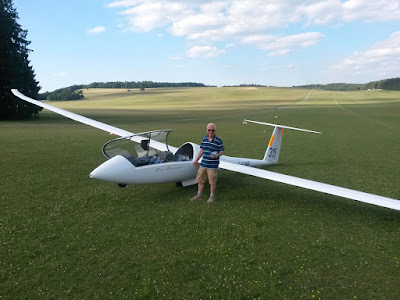 Nick von M flew 319 for the first time and came back after an hour to let someone else have a go but after a short break he was sent up again for another go. John had the bare faced cheek to tell us his shorts were tested to CS23 but most agreed they had suffered a structural failure. 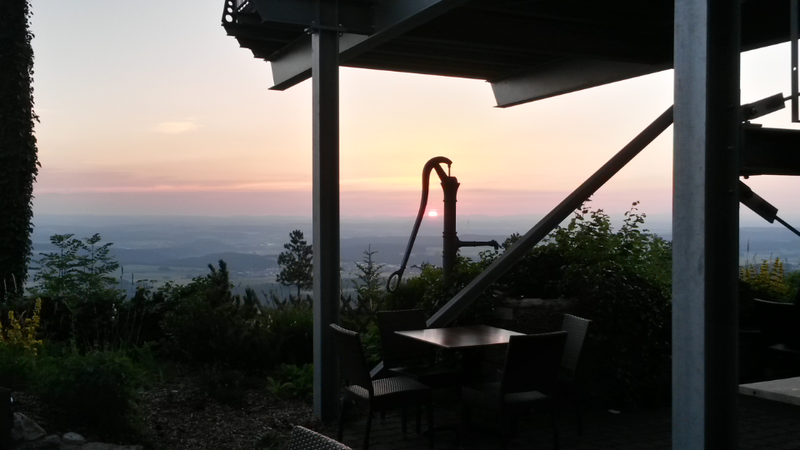 The evening finished with a meal at the restaurant on the hill. Light winds 250/05, cloudbases to about 3000ft QFE, and some good thermals. 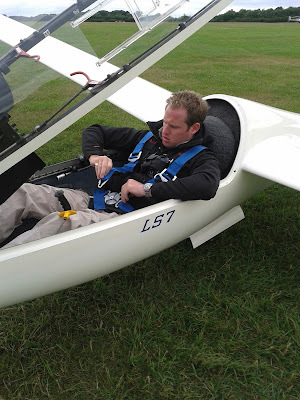 Iain Segall arrived first thing in the morning, so flying got off to an early start. 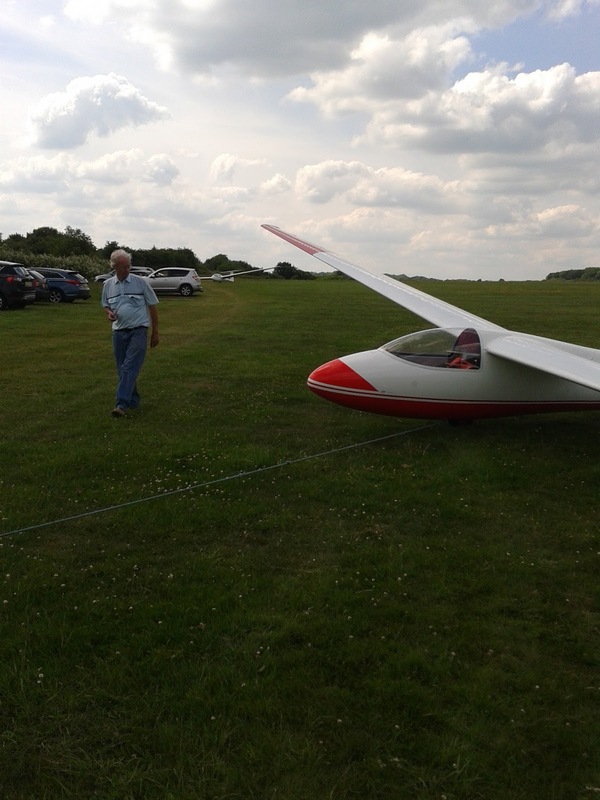 The Junior is now rigged and flying after its trip to Thame. Many thanks to Bob for his help and allowing me some time for a quick cuppa. 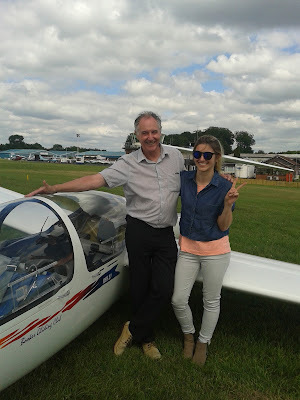 Ashlea and Mike were the trainees for the afternoon, learning the subtleties of circuits approaches and landings. 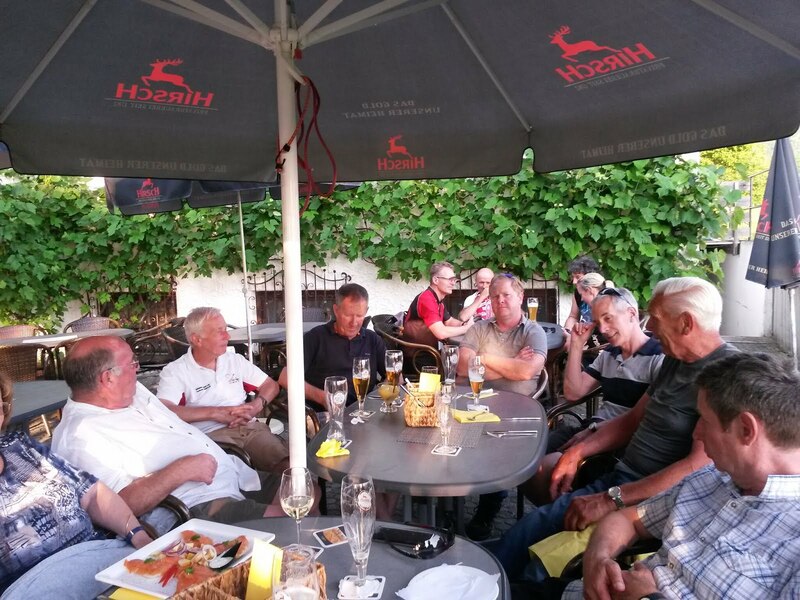 A busy evening group took over and flew well into the evening. 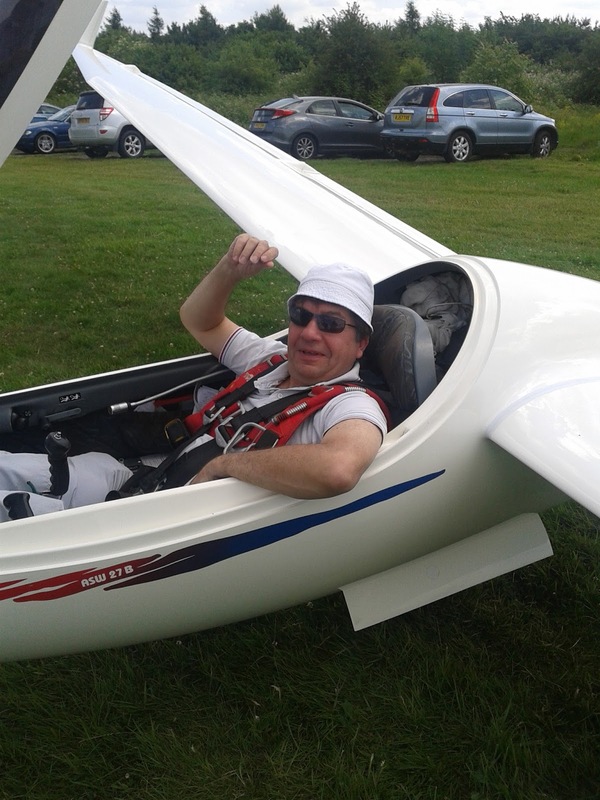 Naturally Graham in the K21 was seen flying in all sorts of odd attitudes. 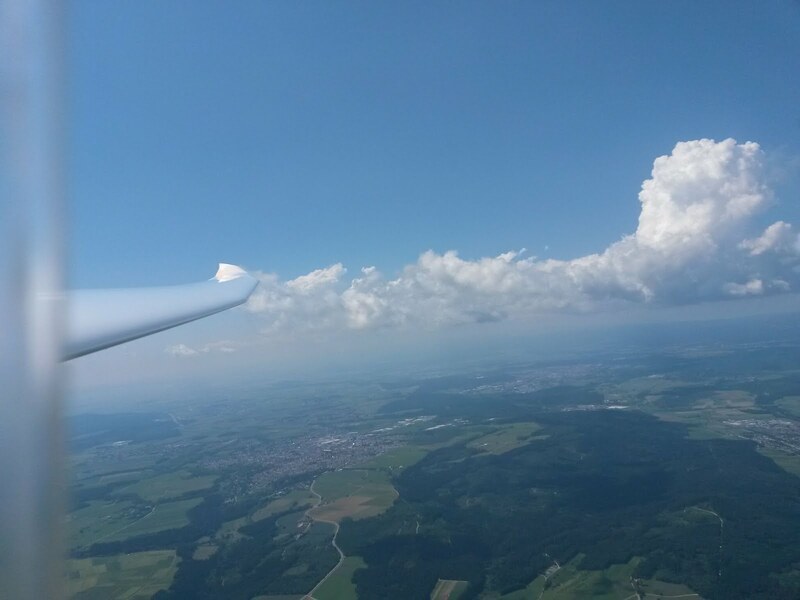 Winds 250/15, general overcast with some weak thermals. Mrs Walter found a new way of walking her lovely dogs, Billy and Missey. An 80th birthday celebration. 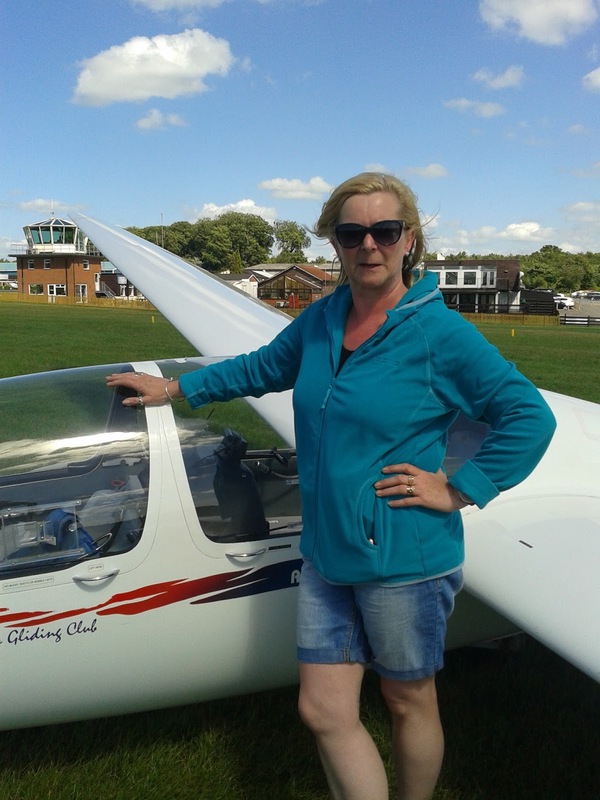 Afterwards she said "It was so peaceful and the views were wonderful, I really enjoyed it"
We welcome Jane Wood who is now taking a refresher course to get back up to speed. Jane just getting ready for flight. Looks like a good day tomorrow, come on up and get the single seaters going. The week one cohorts have arrived and enjoyed a meal and the sunset at the hotel just across from the accommodation.